Kidzmet has received PTPA's Seal of Approval—a coveted parent award that is currently rated the #1 Awards Seal recognized by parents across North America. I plan to include [my son's] profile in his registration packet to help his prospective teachers understand him better. I also reviewed this site in my role as a teacher...I would love getting that profile as I planned each year for instruction. Kidzmet.com has received the PTPA Seal of Approval—a coveted parent award that is currently rated the #1 Awards Seal recognized by parents throughout the United States and Canada. PTPA Media is North America’s largest parent community, with over 40,000 volunteer parent testers. Because independent parent volunteers evaluate these products in their own homes, PTPA winners are chosen based on merit and consumer experience—not on commercial considerations. A growing number of studies indicate that “academic achievement and student behavior are influenced by the quality of the teacher and student relationship.” (Jones, Vernon & Louise. Responsible Classroom Discipline. Boston: Allyn and Bacon, Inc., 1981. pg 95) As such, the quality of the teacher-student relationship can make or break the student's learning trajectory for the school year...and potentially for years beyond. Kidzmet's Student Snapshots help ensure that new teachers understand the optimal ways to personalize learning for each unique student...before the bell rings on the first day of school. 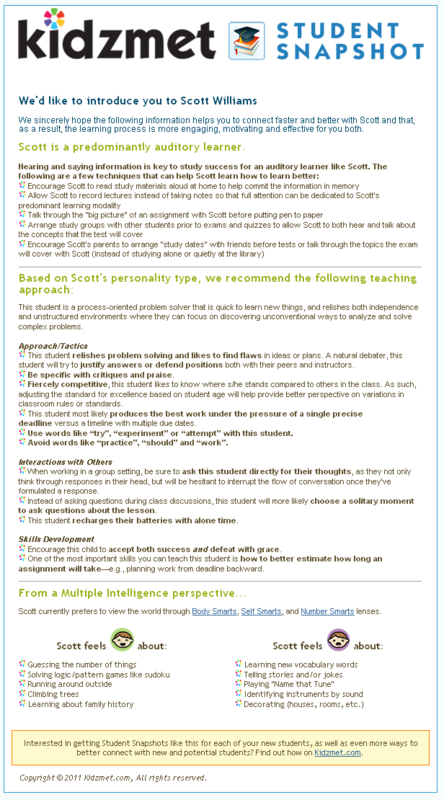 The snapshot includes detailed recommendations for the new teacher based on the child's personality type, multiple intelligence preferences and predominant cognitive style. Kidzmet Student Snapshots cost $0.99 each. One independent tester stated, "[the Pairing Portrait] only takes about 10 minutes and you get a complete document that I feel was a pretty accurate snapshot of my son. He will be starting middle school in the fall with all new teachers and I plan to include the profile in his registration packet to help his prospective teachers understand him better. I also reviewed this site in my role as a teacher. It has great planning ideas and I would love getting that profile as I planned each year for instruction...I would recommend this site to parents and teachers alike." 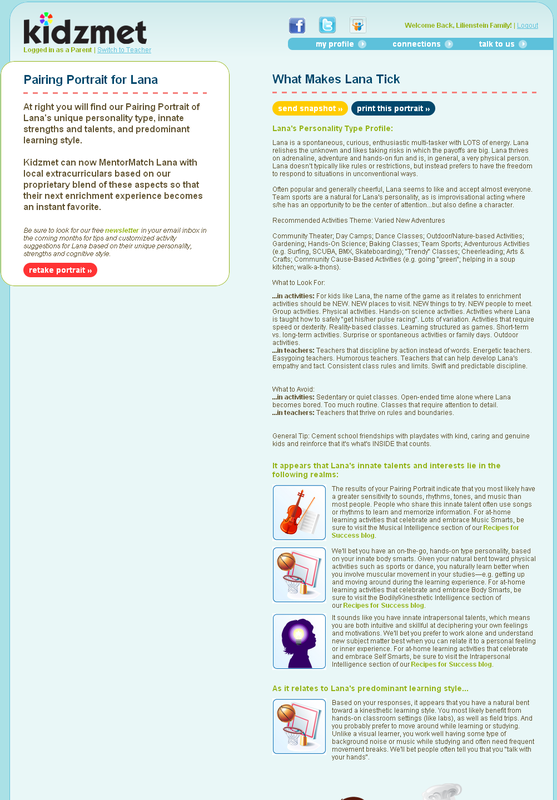 Launched in Spring of 2011, Kidzmet.com weaves together personality type, multiple intelligences and cognitive style to help teachers and parents understand students' learning preferences so that they can create individualized learning experiences that are as inspiring, engaging and effective as possible for each unique child. Kidzmet's Recipes for Success blog provides at-home learning activity recommendations that expose kids to different aspects of the whole child curriculum through the multiple intelligence lenses through which they most enjoy exploring the world. Kidzmet was recently recognized by Brett Larson of KillerApps.tv as among the "best back to school tech that every parent should consider." Parents can send new teachers a Kidzmet Student Snapshot for $0.99 so that they know how to tailor lesson plans to be as effective and engaging as possible for the child. Kidzmet's FREE Pairing Portrait helps parents identify optimal afterschool enrichment activities for their kids.